In this post we will introduce you to the most popular workflow management tool - Apache Airflow. 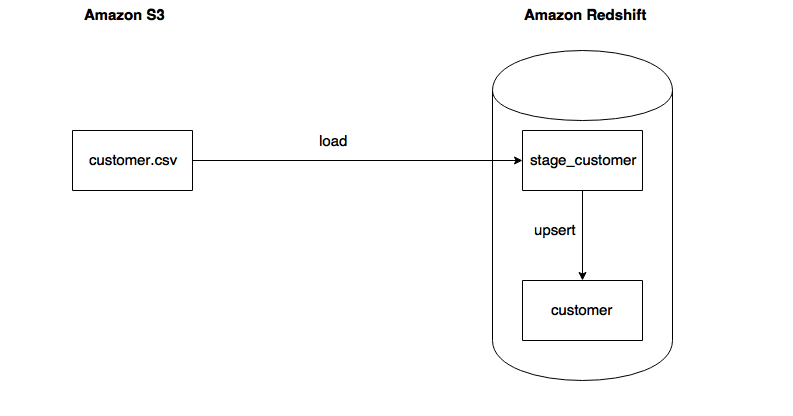 Using Python as our programming language we will utilize Airflow to develop re-usable and parameterizable ETL processes that ingest data from S3 into Redshift and perform an upsert from a source table into a target table. We will also show how to deploy and manage these processes using Airflow. 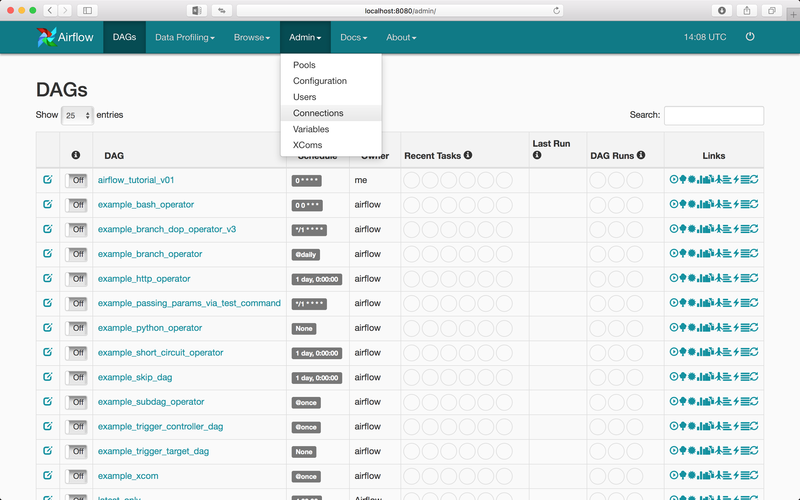 Apache Airflow in an open-source workflow manager written in Python. It was originally created by Maxime Beauchemin at Airbnb in 2014. The project joined the Apache Software Foundation’s incubation program in March 2016. Currently it has more than 350 contributors on Github with 4300+ commits. Airflow is not a data processing tool such as Apache Spark but rather a tool that helps you manage the execution of jobs you defined using data processing tools. 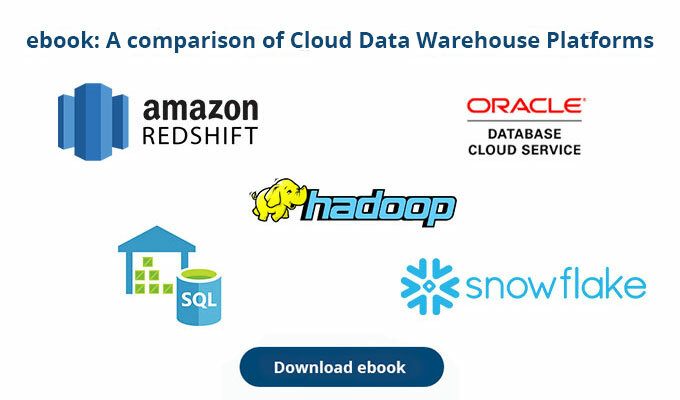 As a workflow management framework it is different from almost all the other frameworks because it does not require specification of exact parent-child relationships between data flows. Instead it requires that you only define direct dependencies (parents) between data flows and it will automatically slot them into a execution DAG (directed acyclic graph). A DAG or Directed Acyclic Graph – is a collection of all the tasks we want to run, organized in a way that reflects their relationships and dependencies. This is the workflow unit we will be using. Operators describe a single task in a workflow (DAG). The DAG will make sure that operators run in the correct order; other than those dependencies, operators generally run independently. In fact, they may run on two completely different machines. The operators are not actually executed by Airflow, rather the execution is pushed down to the relevant execution engine like RDBMS or a Python program. In the following picture we can observe a DAG with multiple tasks (each task is an instantiated operator). Notice that DAGs allow us to specify the execution dependencies between tasks. Before starting the installation we have to specify a home folder for Airflow. 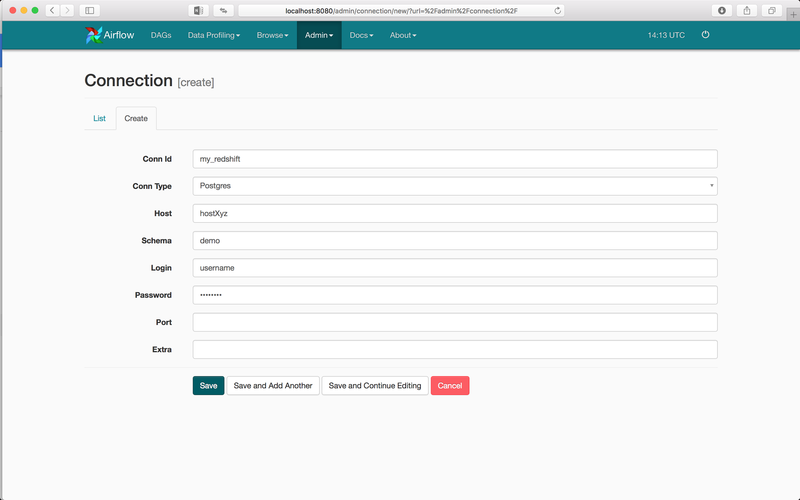 This is the place where Airflow will store its internal database and look for new DAG and operators that we define. We can also set a permanent home on a UNIX machine by editing the bash profile file and adding into it the same line. Lastly, we have to do the one-time initialization of the database Airflow uses to persist its state and information. By default it’s a SQLite file (database), but for concurrent workloads one should use backend databases such as PostgreSQL. The configuration to change the database can be easily done by just replacing the SQL Alchemy connection string value within the airflow.cfg file found in Airflow home. Now we can access the webserver at address localhost:8080 in the browser. Accordingly we will build a single DAG to manage the workflow and two operators that define exact execution of tasks. 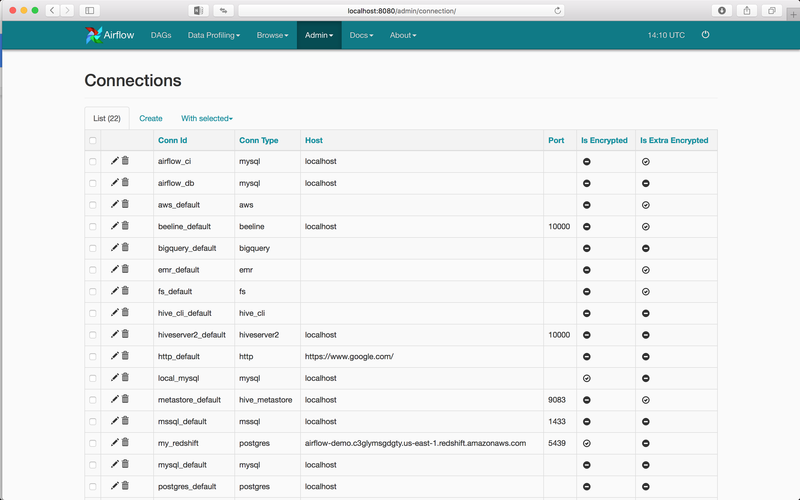 Airflow allows us to define global connections within the webserver UI. Those global connections can then be easily accessed by all Airflow operators using a connection id that we specified. This is not only convenient for development but allows a more secure storage of sensitive credentials (especially compared to storing them in plain text). First we have to open the webserver at localhost:8080 address. Then in the Admin tab on the top of the page we can access the Connections subpage. Now in any application that utilizes Airflow for workflow management, we will be able to connect to our Redshift database only using the Conn Id value that we just defined. We are going to develop an operator which transfers a CSV file stored in S3 into a database in Redshift. This operator will be re-usable because the execution only depends on the input parameters. To accomplish our task of moving data from S3 to Redshift we need more input parameters such as the location of S3 bucket, access credentials for S3 data, name of the S3 file, name of the target table in Redshift… We also have to specify the logic for moving the data. Firstly we will define a proper constructor. The following is our constructor function rewritten to allow the input of more information. The variables that are passed into the operator will get stored as instance variables of the operator. Now we are going to implement the actual logic that connects to a Redshift database and uses the COPY function to load data from an S3 file. This is placed in the execute() function. Lastly, we have to define a plugin according to this Airflow interface. The Plugin will inject our custom operator into Airflow’s context. This way our operator can be imported as an Airflow native operator when we start defining the DAG. To summarize everything we just did, I will copy the whole code that defines the S3ToRedshiftOperator operator. The upsert operator will take as input two tables: source table which contains the latest data and the target table. In the target table we want to update the whole row if there is a row with the same business key (primary key). If there isn’t a matching row with the same business key in the target table, we will just insert the key from the staging table. This operator will be re-usable because the execution is parametrized. Defining the operator for Upserts in Redshift will follow the same pattern as for Loading the data from S3. We will define the functionality of __init__ and execute functions. sql_statement = "begin transaction; "
sql_statement += "delete from " + self.dest_table + " using " + self.src_table + " where "
sql_statement += " and "
sql_statement += " insert into " + self.dest_table + " select * from " + self.src_table + " ; "
sql_statement += " end transaction; "
The code for both operators ( the .py files) now have to be placed within a folder called plugin in our Airflow home folder. Only when placed in that folder can they be recognized by Airflow. 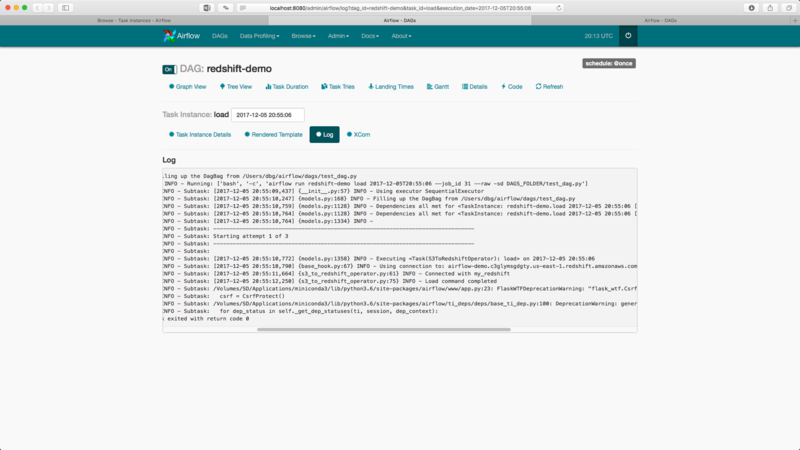 Above we defined a new DAG that has an id redshift-demo and will be executed by the Scheduler just once on 1.6.2017. with two retries spaced five minutes apart. Just defined as this, the DAG is not particularly useful. We want it to execute the operators we defined. For that we have to add tasks to the DAG that will be executed. A task is just an instantiated operator where we provide all the specific information required for execution. We can also observe that the import location is based on the name we gave each plugin ie. redshift_upsert_plugin. We will now instantiate both the S3ToRedshiftOperator operator which transfers data from S3 to Redshift and the RedshiftUpsertOperator which performs the Upsert. The last statement load >> upsert defines the dependency between tasks in the DAG. Specifically that task load will be executed before the task upsert. 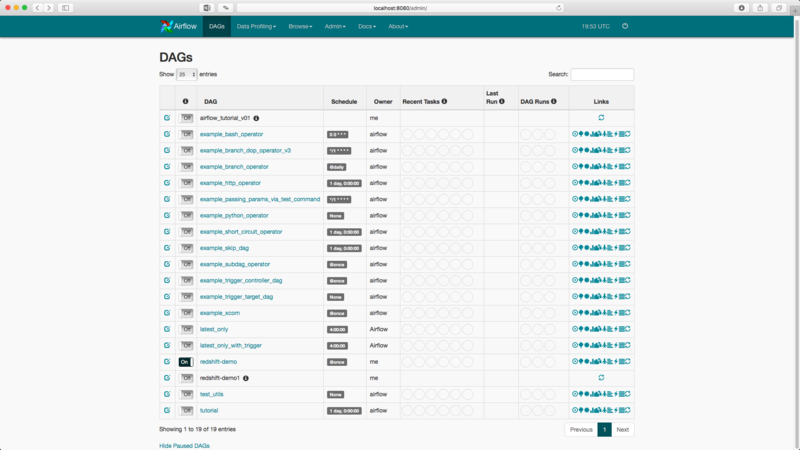 The code for defining the DAG has to be placed in the dags folder inside our Airflow home folder as shown in the example picture for plugins. Airflow gives us the ability to test how a single task within the DAG context works. This way we can debug operators during development. To execute a DAG we must first start the Airflow scheduler. The scheduler is what actually looks at the Airflow home folder for new DAG’s and manages the scheduling of them. Then we have to unpause the DAG that we want to run. Because each DAG has a schedule associated with it when it will be executed, by default it’s paused and won’t execute until we resume it. I recommend using the Webserver UI for this task. Using the Webserver UI we can just press the Play button (first button in the links tab) and that will run the DAG. By going to the Browse -> Task Instances tab in the Webserver UI we can track the execution of each task. At Sonra we love Apache Airflow. What has your experience been. Contact us if you need help and/or support with your Airflow implementation. We can create customisations for you.